Nearly 22,000 homeless people were counted during January’s annual tally. Advocates for the homeless and officials working to end homelessness all point to rising rents and the lack of affordable or permanent housing options as underlying causes. The state of Washington’s homeless population rose by 3.5 percent over last year despite increasing efforts to place more people living without shelter into permanent housing, according to a summary of counts from across the state. The rise affected five of the state’s six most populous counties, including Clark, Snohomish and Spokane. King County, home to more than half the state’s homeless, saw an increase of 8 percent over last year’s count of 10,730, according to the numbers released last week. That includes people in shelters or transitional housing. More startling is the 10 percent increase in the number of people in the state who are living outdoors. 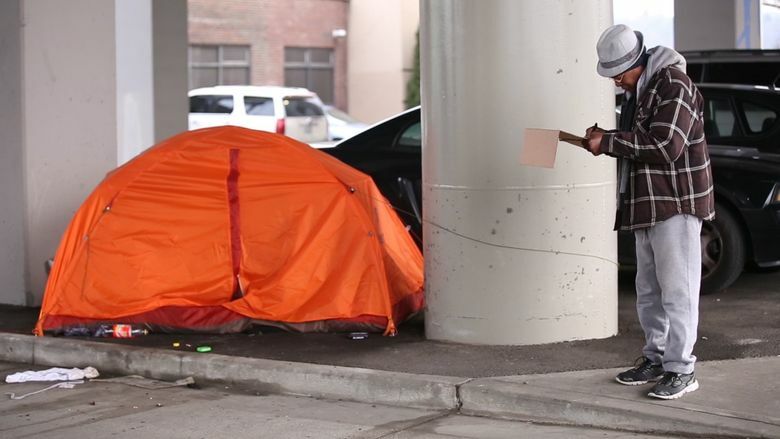 The number of homeless sleeping on the streets, tent encampments and underneath overpasses in Washington jumped from 8,474 to just over 9,300. An additional 12,543 were counted in shelters and transitional housing. The numbers “starkly demonstrate that while parts of the state are booming economically, the growth is not shared by everyone,” said Tara Lee, deputy communications director for Gov. Jay Inslee. Advocates for the homeless and officials working to end homelessness all point to rising rents and the lack of affordable or permanent housing options as underlying causes. Kirsten Jewell, chair of the Washington State Housing Advisory Council on Homelessness, said the numbers reveal the difficulty of slowing the real-estate trends that force many into homelessness. The crisis-response system is making progress on getting people off the street and back into housing, she said. The median rent for a one-bedroom apartment statewide is $1,652, according to research by the real-estate website Zillow. Inslee is committed to exploring ways to preserve existing affordable housing and increasing quality affordable units statewide, Lee said. The 2017 counts, conducted in January, are mostly estimates of people living outdoors and in various sheltering programs. The U.S. Department of Housing and Urban Development requires cities, counties and other communities to conduct a count in order to receive federal aid for local homelessness programs. Conducted by volunteers, the counts were carried out in seven areas: Seattle-King County, Everett-Snohomish County, Tacoma-Pierce County, Spokane, Yakima, Vancouver-Clark County and the state’s smaller, more rural communities. The tallies increased in nearly every county, according to figures released Tuesday. Among the few bright spots, a 25 percent decrease in Pierce County after two years of sharp increases, bringing the county’s tally to 1,321. Officials acknowledge that the figures provide an imperfect glimpse of the overall homeless population, which can fluctuate sharply from year to year and is difficult to accurately tally. The 2017 counts will become the baseline as state legislators push to increase state funding for local efforts to reduce homelessness. A bill to make a $40 surcharge on documents recorded by county auditors permanent was approved by the state House of Representatives in May, and is being considered by the Senate. The surcharge generates around $30 million each year for homelessness and housing programs. The state’s 2017 strategic plan calls for implementing new performance goals for local programs receiving state aid, and shifting resources to programs focused on housing families and the chronically homeless.